Simone Arianne Biles (born March 14, 1997) is an American artistic gymnast. Biles is the 2016 Olympic individual all-around, vault and floor gold medalist, and balance-beam bronze medalist. She was part of the gold-medal-winning team dubbed the "Final Five" at the 2016 Summer Olympics in Rio de Janeiro. With her win in Rio, Biles became the sixth woman to win an individual all-around title at both the World Championships and the Olympic Games. Biles set an American record for most gold medals in women's gymnastics at a single Olympic Games (four). At the 2018 World Artistic Gymnastics Championships in Doha, Biles became the female gymnast with the most World all-around titles (4) and total World medals (20), as well as the gymnast with the most World gold medals of any gender (14). She also became the tenth gymnast and first American gymnast to win a World medal on every event. Many observers consider her to be the greatest gymnast of all time. Simone Arianne Biles was born on March 14, 1997, in Columbus, Ohio, the third of four siblings. Her birth mother, Shanon Biles, was unable to care for Biles or her other children – Ashley, Tevin, and Adria – due to her drug and alcohol addiction, so the children were in and out of foster care. Biles' birth father, Kelvin Clemons, abandoned his family, struggled with addictions, and was never present in his daughter's life. With the help of his second wife, Nellie Cayetano Biles, Shanon's father Ron  (who has two nearly-adult sons, Ron Jr. and Adam), began temporarily caring for Shanon's children in 2000, in the north Houston suburb of Spring, Texas, after finding out his grandchildren got placed into foster care. In 2003, the couple officially adopted the two youngest children, Simone and Adria, and Ron's sister Harriet, adopted the two oldest. Biles holds Belize citizenship through her mother and refers to Belize as being her second home. Biles and her family practice Catholicism. Biles first tried gymnastics at 6 years old as part of a day-care field trip. The instructors suggested she continue with gymnastics. Biles soon enrolled in an optional training program at Bannon's Gymnastix. She began training with coach Aimee Boorman at age 8. Biles began her career on July 1, 2011, at the 2011 American Classic in Houston. She placed third all-around, first on vault and balance beam, fourth on floor exercise, and eighth on uneven bars. Later that month, Biles competed at the 2011 U.S. Classic in Chicago, Illinois, where she placed twentieth all-around, fifth on balance beam and floor exercise. Biles' first meet of 2012 was again the American Classic in Huntsville, Texas, where she placed first all-around and on vault, tied for second on floor exercise, placed third on balance beam and fourth on uneven bars. Biles' placement in the American Classic secured her a spot to compete at the 2012 USA Gymnastics National Championships. She later competed at the 2012 U.S. Classic in Chicago. She finished first all-around and on vault, second on floor exercise, and sixth on balance beam. In June, she made her second appearance at the U.S. National Championships in St. Louis, Missouri. She finished third all-around, first on vault, and sixth on uneven bars, balance beam, and floor exercise. After this performance, Biles was named to the U.S. Junior National Team by a committee headed by Márta Károlyi: National Team Coordinator from 2001–2016. Biles' senior international debut was in March at the 2013 American Cup, a FIG World Cup event. She and Katelyn Ohashi were named as replacements for Elizabeth Price and 2012 Olympic gold medalist Kyla Ross, both of whom withdrew from the competition because of injuries. Biles led for two rotations but finished second behind her teammate, Ohashi, after a fall off the beam. Biles immediately went on to compete at the 2013 City of Jesolo Trophy in Jesolo, Italy, where she took the all-around, vault, balance beam, and floor exercise titles in addition to contributing to the U.S.' team gold medal. She and the U.S. delegation then competed at an international tri-meet in Chemnitz, Germany, against teams from Germany and Romania. The U.S. won the team gold medal. In addition, Biles won the vault, balance beam, and floor titles, but tied for second in the all-around behind Ross after a fall on the uneven bars. In July, Biles competed at the 2013 U.S. Classic. She performed poorly, falling several times, and did not compete vault after twisting her ankle on the floor exercise. Afterward, she was invited to a private camp with the national team coordinator, Márta Károlyi, and consulted a sports psychologist. Biles went on to compete at the 2013 USA Gymnastics National Championships in August, where she was crowned the national all-around champion ahead of Ross. Biles also won silver on all four individual events. After the USA Gymnastics National Championships, she was named to the Senior National Team and was invited to the qualifying camp for the 2013 World Artistic Gymnastics Championships in Texas, where she was named to the World Championships team. In October, Biles competed at the 2013 World Artistic Gymnastics Championships in Antwerp, Belgium. She qualified first in the all-around, second to the vault final, sixth to the uneven bars final, fifth to the balance beam final, and first to the floor final, making her the first American gymnast to qualify to the all-around and all four event finals since Shannon Miller in 1991. Biles competed cleanly during the women's individual all-around and won the competition with a score of 60.216, almost a point ahead of silver medalist Ross and almost a point and a half better than the bronze medalist, 2010 world all-around champion Aliya Mustafina. Biles became the seventh American woman and the first African-American to win the world all-around title. In event finals, she won silver on the vault, behind defending world champion and Olympic silver medalist McKayla Maroney and ahead of 2008 Olympic gold medalist Hong Un Jong of North Korea; bronze on balance beam, behind Mustafina and Ross; and gold on the floor exercise, ahead of Italy's Vanessa Ferrari and Romania's Larisa Iordache. She finished fourth in the uneven bars final, behind China's Huang Huidan, Ross, and Mustafina. However, there was no team event, so she did not get a medal for that at Antwerp. Biles missed the start of the season due to an aggravated shoulder injury, sitting out the 2014 AT&T American Cup and the 2014 Pacific Rim Championships. Biles' 2014 debut came at the U.S. Classic in Chicago. She won the all-around by a wide margin and also took first place on vault, beam (tied with Ross), and floor. At the 2014 USA Gymnastics National Championships, Biles repeated as national all-around champion after two days of competition, finishing more than four points ahead of silver medalist Ross, despite a fall from the balance beam during her final routine of the meet. She won the gold on vault and floor, tied for the silver on balance beam with Alyssa Baumann, and finished fourth on the uneven bars. She was once again named to the Senior National Team. On September 17, Biles was selected to compete at the 2014 World Artistic Gymnastics Championships in Nanning, China. She dominated the preliminary round despite a major error on the uneven bars, qualifying in first place to the all-around, vault, beam, and floor finals, in addition to contributing to the U.S. team's first-place qualification into the team final. During the team final, Biles led the United States to its second consecutive world team championship, which they won over the second-place Chinese team by nearly seven points. In the all-around, Biles performed cleanly on all four events, bettering her bars score from qualifications by over a point, and won her second consecutive world all-around title ahead of two good friends, Ross and Iordache. Biles became the second American woman to repeat as world all-around champion, following Miller (1993 and 1994), and the first woman of any nationality to do so since Russia's Svetlana Khorkina (2001 and 2003). She also received extra press when a video of her fleeing from a bee on the podium during the all-around award ceremony went viral. Biles finished behind North Korea's Hong Un Jong in the vault competition, taking her second consecutive silver medal in that event, but went on to win the gold in the balance-beam final ahead of China's Bai Yawen and the gold in the floor exercise final, again, ahead of Iordache. This brought her total of World Championship gold medals to six, the most ever by an American gymnast, surpassing Miller's five. Biles competed at the 2015 AT&T American Cup at AT&T Stadium in Arlington, Texas, on March 7. She placed first with a score of 62.299, 4.467 points ahead of second-place finisher U.S. teammate MyKayla Skinner. Later that month, Biles was nominated for the James E. Sullivan Award. She ended the month at the 2015 City of Jesolo Trophy, winning the all-around title with 62.100. On July 25, she competed at the U.S. Classic and finished first in the all-around, ahead of 2012 Olympic all-around champion Gabby Douglas and Maggie Nichols, with a score of 62.400. On the beam, she scored a 15.250 and took first at the event, ahead of Douglas and 2012 Olympic beam bronze medalist Aly Raisman. She scored a 16.050 on the floor and claimed first on the event, 1.050 points ahead of Douglas and also ahead of Nichols and Bailie Key. She had a small hop on her Amanar vault and scored a 16.000. She then scored 15.150 on her second vault, to score an average of 15.575 and place first in the event, ahead of 2014 Worlds vault bronze medalist and teammate MyKayla Skinner, who averaged 14.950. Biles ended on bars and scored a 15.100 to claim the all-around title. She placed fourth in the event behind 2014 Worlds teammate Madison Kocian, Douglas, and Key. At the 2015 U.S. National Championships, Biles secured her third all-around national title, becoming only the second woman ever to do so, 23 years after Kim Zmeskal (1990, 1991, 1992). Biles, along with Douglas, Dowell, Kocian, Nichols, Raisman, and Skinner, was selected to represent the United States at the 2015 World Artistic Gymnastics Championships in Glasgow, Scotland. Biles once again qualified in first place in the all-around, vault, beam, and floor finals. Her uneven bars score would have qualified her in 8th place in that final as well, but she was excluded, as per the rules, after teammates Kocian and Douglas qualified ahead of her. In team finals, she helped the United States team win their third consecutive gold medal at a World Championships event. During the all-around final, Biles performed below her usual standard, taking a large hop on the vault, landing out of bounds on floor (which she stated was a first), and grasping the beam to prevent a fall. However, her final score of 60.399 was more than enough to secure the title with her largest margin of victory yet (over a point ahead of silver medalist Gabby Douglas and bronze medalist Larisa Iordache). With that victory, Biles became the first woman to win three consecutive all-around titles in World Gymnastics Championships history. During day one of event finals, Biles competed on vault, taking bronze behind Maria Paseka (RUS) and Hong Un Jong (PRK). On day two, she competed on balance beam and floor exercise, retaining her world title on both events by large margins. This brought Biles' total World Championships medal count to 14, the most for any American, and total gold medal count to 10, the most for any woman in World Championships history. Biles went into the 2016 season as a fourth-year senior and the reigning National champion. On December 17, 2015, USA Gymnastics announced that she would compete at the 2016 Pacific Rim Gymnastics Championships, in April 2016 in Everett, Washington. In April, Biles began her season at the Pacific Rim Championships, where she won the all-around title and had the highest score on vault (where she debuted a more difficult second vault), floor exercise (where she debuted a new floor routine), and balance beam. Additionally, the U.S. won the team title by a wide margin. Biles did not compete in the event finals. On June 4, Biles competed at the Secret U.S. Classic on two events only, the uneven bars and beam. She placed first on balance beam with a 15.650 and placed fifth on uneven bars with a 15.1. In the following weeks at the 2016 U.S. National Championships, Biles won the all-around title by a wide margin of 3.9 points over Aly Raisman. She won the gold medal on vault and floor exercise, receiving scores of at least sixteen all four times. She also won the gold medal on balance beam and placed fourth on uneven bars. On July 10, Biles was named to the team for the 2016 Summer Olympic Games in Rio de Janeiro, alongside Gabby Douglas, Laurie Hernandez, Madison Kocian and Aly Raisman. In September 2016, Biles's medical information was released following the Russian cyber espionage group Fancy Bear's hack into the World Anti Doping Agency. Biles then disclosed on Twitter that she has attention deficit hyperactivity disorder and was permitted to take medication for it, having applied for and received a Therapeutic Use Exemption. Biles appeared with gymnasts Dominique Dawes and Nadia Comăneci in a commercial for Tide called "The Evolution of Power" prior to the 2016 Summer Olympics. With four Olympic gold medals, Biles set an American record for most gold medals in women's gymnastics at a single Games, and equaled a number of other records with her medals won in Rio. 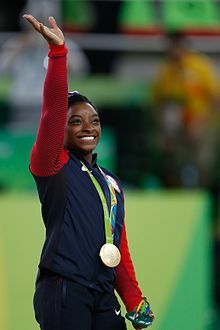 Biles' win of four gold medals was the first instance of a quadruple gold medallist in women's gymnastics at a single Games since Ecaterina Szabo (Romania) in 1984, and the fifth overall, after Larisa Latynina (USSR, 1956), Agnes Keleti ( HUN, 1956), Věra Čáslavská (CZE, 1968) and Szabo. Biles became the sixth female gymnast to have won an individual all-around title at both the World Championships and the Olympic Games; the others being Larisa Latynina, Věra Čáslavská, Ludmilla Tourischeva, Elena Shushunova and Lilia Podkopayeva. Biles is the first female gymnast since Lilia Podkopayeva (UKR) in 1996 to win the all around gold as well as an event final gold, and the first female gymnast since Podkopayeva to win the Olympic all around title while holding the World and European/American individual all around titles. Biles joins Latynina (1956–1960), Čáslavská (1964–1968) and Tourischeva (1968–1972), as the fourth female gymnast to win every major all-around title in an Olympic cycle. Biles joined Mary Lou Retton in 1984, Shannon Miller in 1992 and Nastia Liukin in 2008 in winning five medals at a single Olympic Games, along with Szabo (ROM, 1984), Nadia Comaneci (ROM, 1976) and Karin Janz (East Germany, 1972). Olga Mostepanova (USSR) also won five gold medals at the Alternate Olympics in 1984. The overall record for most women's Olympic gymnastics medals at a single games (majority gold), remains six medals (Latynina, 1956, 1960 and 1964, Keleti, 1956, Caslavska, 1968, Daniela Silivas, 1988). As the first American female gymnast to be given the honor, Biles was chosen by Team USA to be the flag bearer in the closing ceremonies. Biles stated that she planned to take all of 2017 off and to resume training in early 2018. After the 2016 Rio Games, Simone wrote an autobiography with co-journalist Michelle Burford, Courage to Soar: A body in Motion, A Life in Balance. According to the Los Angeles Times, Biles stated, "I want people to reach for their dreams and there are so many people who have inspired me with their love and encouragement along the way-and I want to pass on that inspiration to readers." The book hit number one on The New York Times best sellers Young Adult list the week of January 8, 2017 and was turned into a Lifetime biopic. On March 1, Biles was revealed as one of the contestants who would compete on season 24 of Dancing with the Stars attempting to replicate her Rio teammate Laurie Hernandez's win in season 23. She was paired with professional dancer Sasha Farber. Before the competition even started, Biles and Farber were favorites to win. Despite high scores and praises from the judges throughout the season, Biles and Farber were eliminated on May 15, 2017, one week before the finals, finishing in fourth place. In August, during the 2017 P&G National Championships Biles stated that she has returned to the gym to start conditioning. In October it was announced that Biles' new coach would be Laurent Landi, the former coach of Olympic teammate Madison Kocian. This news came after it was announced that Biles' former coach, Aimee Boorman, was moving to Florida to take the executive director position at Evo Athletics. Biles was officially added back to the National Team on March 1 after the Athlete Selection Committee viewed videos demonstrating Biles current performance level. Biles' first competition was the U.S. Classic in July, where she won the all-around title ahead of Riley McCusker by 1.200 points. She also won the gold medal on floor and balance beam and recorded the highest single vault score. Her all-around score of 58.700 became the highest score recorded under the 2017–2020 Code of Points despite a fall on the uneven bars and an out-of-bounds penalty on floor exercise. Her return to competition was highlighted by numerous upgrades to her routines from 2016, including a Fabrichnova (double-twisting double back dismount) and a Van Leeuwen on uneven bars and a Moors (double-twisting double layout) on floor exercise. In August, Biles competed at the 2018 National Championships where she placed first on every event over two days of competition. She is the first woman to do so since Dominique Dawes in 1994. Biles won the all-around title 6.55 points ahead of second-place finisher and reigning world champion Morgan Hurd and set a record for the most national all-around titles with five wins. This placement also marked her fourth national vault title, third national balance beam and floor exercise titles, and first national uneven bars title. Her 60.100 all-around score from the first day of competition was the first score recorded above 60 since her own all-around victory at the 2016 Olympics. She was named to her seventh national team and was invited to the October selection camp for the 2018 World Championships. During the 2018 Youth Olympic Games, the mixed multi-discipline teams were named after gymnastics legends including Nadia Comăneci and Kōhei Uchimura. The team named after Biles won gold. In October, Biles participated in the World Team Selection Camp. She placed first in the all-around as well as first on vault and floor exercise. She placed second on the uneven bars behind McCusker, and fourth on balance beam (due to hands touching the mat on dismount) behind Kara Eaker, McCusker, and Ragan Smith. Biles debuted a brand new vault, a Yurchenko with a half turn on with a stretched salto forward with two turns (Cheng with an extra half twist) which was later added to the Code of Points as the Biles after she performed the vault successfully at the World Championships qualifications. The following day she was named to the team to compete at the 2018 World Championships alongside McCusker, Hurd, McCallum, Eaker, and alternate Ragan Smith. In late October, at the 2018 World Championships in Doha, Qatar, Biles went to an emergency room the night before the qualification round because of stomach pains that turned out to be a kidney stone. After confirming that it was not appendicitis, she checked herself out of the hospital. The following day, she qualified to the all-around, vault, balance beam, and floor exercise finals in first place, and to the uneven bars final in second place behind Nina Derwael of Belgium. The US also qualified to the team final in first place. During the team final, Biles competed on all four events, recording the highest score of any competitor on vault, uneven bars, and floor exercise. The U.S. team won the gold medal with a score of 171.629, 8.766 points ahead of second place Russia, beating previous margin of victory records set in the open-ended code of points era at the 2014 World Championships (6.693) and the 2016 Olympic Games (8.209). In the all-around final, Biles won the gold medal with a score of 57.491, nearly 1.7 points ahead of silver medalist Mai Murakami of Japan, despite sitting her Biles vault, falling off balance beam, and going out of bounds on floor exercise. Earning her fourth world all-around title, Biles set a new record for most women's World All-Around titles, surpassing the previous record of three held by Svetlana Khorkina. She also became the first defending Olympic women's all-around champion to earn a world all-around title since 1972 Olympic champion Lyudmilla Turischeva did so in 1974. In the event finals, Biles won the gold medal on vault, her first ever world vault title. The two vaults she competed were a Cheng and an Amanar. This marked her thirteenth World gold medal, resulting in her winning the most Gymnastics World Championships titles of any gender, breaking Soviet Vitaly Scherbo's previous record of twelve gold medals. She then won the silver medal on uneven bars, again behind Derwael. By winning a medal on uneven bars, Biles became the first American and the tenth female gymnast from any country to have won a World Championship medal on every event. The following day, she won the bronze medal on balance beam after a large balance check on her Barani. She then won the gold medal on floor exercise with a strong routine. In doing so, she became the first U.S. gymnast and first non-Soviet gymnast to win a medal on every event at a single World Championships, as well as the first gymnast from any country to do so since Elena Shushunova in 1987. Her 6 medals at this World Championships brought her total number of world medals to 20, which tied her with Khorkina for most world medals won. In January it was announced that Biles would compete at the Stuttgart World Cup in early March. It was her first World Cup appearance not on American soil. She finished in first place, 3.668 points ahead of second place Ana Padurariu of Canada. Biles signs a 35-ton steel plate alongside Katie Ledecky to signal the start of construction of the USS Enterprise. Biles was named Team USA Female Olympic Athlete of the Year in December 2015, making her the fourth gymnast to win the honor. In December 2016, Biles was chosen as one of the sponsors of the US Navy aircraft carrier USS Enterprise alongside swimmer Katie Ledecky. They are the first Olympians to be given this honor. In 2016, Simone Biles won the Glamour Award for the Record Breaker. In 2016, she was chosen as one of BBC's 100 Women, and after the world championships, she was named one of ESPNW's Impact 25 and chosen as Sportswoman of the Year by the Women's Sports Foundation. She was also one of the finalists for Time magazine's 2016 Person of the Year. Biles was also nominated for a 2016 ESPY award for Best Female Athlete along with Elena Delle Donne, Katie Ledecky, and Breanna Stewart; Stewart won the award. In July 2017, Biles won the ESPY Award for Best Female Athlete. She is the second gymnast to win this award after Nastia Liukin won it in 2009. In 2017, Simone won the Shorty Awards for the best in sports. At the 2017 Teen Choice Awards, Simone won favorite female athlete, and won Laureus World Sports Award for Sportswoman of the Year in 2017. Simone Biles was named one of the most influential people in the World list by Time Magazine. In May 2018, it was announced that Biles and the other survivors would be awarded the Arthur Ashe Courage Award. In December, it was announced that Biles was named ESPN The Magazine's most dominant athlete of 2018. In February 2019, it was announced that Biles was named Laureus' Sportswoman of the Year for the second time. Biles signed with Octagon in July 2015, who also supports fellow American gymnast Aly Raisman and Olympic swimmer Michael Phelps. In November 2015 she became a Nike-sponsored athlete – announcing the news through Twitter. On November 23, 2015 Biles signed with GK Elite Sportswear to have an exclusive line of leotards. Later in 2015, Biles partnered with Core Power to become a new member of its Everyday Awesome team of athletes. In August 2016, Kellogg's put the Final Five's picture on the Gold Medal Edition of Special berries. On the backside it featured Simone Biles with one of her gold medals from Rio. After the 2016 Rio games, Biles received endorsements from Procter & Gamble, The Hershey Company, and United Airlines. In September 2016, Biles signed with Mattress Firm as a spokesperson for the company's program of supporting foster homes. In 2016, Biles partnered with Spieth America to create a line of gymnastics equipment, and partnered with Beats By Dr Dre, becoming a brand ambassador. In 2018 she became a brand ambassador and collaborated with Caboodles to create a collection of products for women with active lifestyles. In August 2017, Biles announced that she was in a relationship with Stacey Ervin Jr. who is director and head coach at the World Champions Centre. Together the couple adopted a French bulldog named Lilo. On January 18, 2018, Biles released a statement on Twitter confirming that former USA Gymnastics physician Larry Nassar sexually assaulted her. She also called out USA Gymnastics for having an alleged role in allowing the abuse to happen and for covering it up. She did not attend the court hearings that were held from January 16 to 24, 2018 because she was not emotionally ready to face her abuser again. On January 24, 2018 Nassar was sentenced to 40–175 years in prison by Judge Rosemarie Aquilina. In May 2018, it was announced that Biles and the other survivors would be awarded the Arthur Ashe Courage Award. At the 2018 U.S. National Championships Biles designed and wore a teal leotard that she stated was meant to honor the survivors of the scandal and make a statement of unification. Biles is well known for her performance of difficult skills at a high level of execution. Her 2018 routines on vault and floor exercise are the most difficult of all time in women's artistic gymnastics. Below are some of the skills she has performed over the course of her senior career. ^ "GymDivas.Us". GymDivas. Archived from the original on October 29, 2010. Retrieved July 7, 2016. ^ "Simone Biles Gymnastics". Team USA. Retrieved August 10, 2016. ^ "USA Gymnastics JO Meet Results and Live Scores". MeetScoresOnline.com. March 11, 2015. Retrieved July 7, 2016. ^ "GymDivas.Us | Online Resource for Gymnasts in the United States". GymDivas. Archived from the original on October 13, 2014. Retrieved July 7, 2016. ^ Dillman, Lisa (August 27, 2016). "This young lady is light-years ahead of the competition". Los Angeles Times. Retrieved January 20, 2018. ^ Wiedeman, Reeves (August 12, 2016). "Simone Biles Becomes the Greatest Gymnast of All-Time". The New Yorker. Retrieved August 12, 2016. ^ Minutaglio, Rose (August 16, 2016). "1984 Olympic Gold Medalist Mary Lou Retton Says Simone Biles 'Is The Greatest Gymnast Ever'". People Magazine. Retrieved August 16, 2016. ^ "Biography". Simone Biles official site bio. Archived from the original on March 6, 2013. Retrieved June 28, 2016. ^ a b c Barron, David (July 16, 2016). "Spring's Biles poised for perfection in Rio Games". Houston Chronicle. ^ a b "Simone Biles' ex- addict biological mom reveals family rift". Retrieved August 22, 2016. ^ Graves, Will (October 22, 2015). "As Rio nears, gymnastics' Biles is ready to take charge". Associated Press. ^ Michael, Hardy (July 2016). "Gold Rush". Texas Monthly. Austin, Texas. Retrieved August 27, 2016. Biles's father had abandoned her mother and was never present in his daughter's life. ^ O'Neal, Lonnae (July 1, 2016). "The Difficulty Of Being Simone Biles". theundefeated.com. Retrieved August 19, 2016. Simone's grandparents, Ron (grandfather) and Nellie (step-grandmother) became her legal guardians when Biles was 6. They met while Nellie was in college in San Antonio and Ron was in the Air Force and raising daughter Shanon as a single father. ^ "Simone Biles". Biography.com. Retrieved May 30, 2017. ^ Minutaglio, Rose (June 27, 2016). "How Gymnast Simone Biles Overcame Being Given up by Her Mother to Become an Olympic Gold Hopeful". People. Retrieved June 28, 2016. ^ Martin, Jill; Lopez, Elwyn, eds. (August 16, 2016). "Simone Biles has support in another country: Belize". CNN. Retrieved August 27, 2016. ^ Rezac, Mary (August 9, 2016). "These two game-changing Olympians are serious Catholics". Catholic News Agency. Retrieved August 11, 2016. ^ Nick, Zaccardi (August 4, 2014). "Simone Biles chooses UCLA". NBC Sports. Retrieved October 30, 2015. ^ Nick, Zaccardi (July 29, 2015). "Simone Biles turns pro". NBC Sports. Retrieved October 30, 2015. ^ "Simone Biles Biography and Interview". www.achievement.org. American Academy of Achievement. ^ Meyers, Dvora (July 8, 2016). "Simone Biles: Mental Gymnastics". Buzzfeed. Retrieved July 14, 2016. ^ Park, Alice. "Simone Biles Is Taking Her Sport to New Heights". TIME.com. Retrieved July 30, 2016. ^ "McLaughlin, Skinner, Milliet win American Classic titles". USA Gymnastics. July 2, 2011. Retrieved July 15, 2016. ^ "2011 Cover Girl Classic Meet Results Women Competition I" (PDF). USA Gymnastics. Retrieved July 15, 2016. ^ "2011 Cover Girl Classic Vault Rankings Women Competition I" (PDF). USA Gymnastics. Retrieved July 15, 2016. ^ a b "Winners Named at American Classic". USA Gymnastics. May 6, 2012. Retrieved July 16, 2016. ^ "2012 American Classic National Training Center". USA Gymnastics. Retrieved July 16, 2016. ^ a b c d "Simone Biles". USA Gymnastics. Retrieved October 31, 2015. ^ Lawrence, Blythe (March 1, 2013). "Promising pair stands in for Fierce Five". ESPN. Archived from the original on March 3, 2013. Retrieved March 2, 2013. ^ Associated Press (February 26, 2013). "Kyla Ross out of American Cup". ESPN. Retrieved February 27, 2013. ^ "Elizabeth Price Withdraws from American Cup". USA Gymnastics. Retrieved February 23, 2013. ^ Associated Press (March 2, 2013). "Katelyn Ohashi wins 1st senior event". ESPN. Retrieved March 2, 2013. ^ "WAG International Match GER – ROU – USA Chemnitz (GER) 2013 March 30". www.gymnasticsresults.com. Retrieved July 18, 2018. 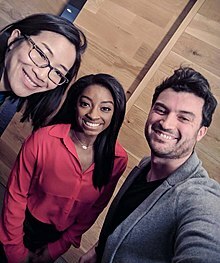 ^ "Interview: Simone Biles & Sports Psychologist Robert B. Andrews". FullTwist.net. April 23, 2014. ^ "Simone Biles Crowned Gymnastics All-Around World Champion". United States Olympic Committee. Retrieved October 31, 2015. ^ Williams, Ollie (October 4, 2013). "World Gymnastics: American Simone Biles wins all-around gold". BBC Sport. Retrieved October 31, 2015. ^ a b "Two-time World all-around champ Biles confirms participation in 2015 AT&T American Cup". USA Gymnastics. Retrieved October 31, 2015. ^ "2014 AT&T American Cup field is set". USA Gymnastics. Retrieved October 31, 2015. ^ "Biles withdraws from 2014 Pacific Rim Championships". USA Gymnastics. Retrieved October 31, 2015. ^ "2014 Secret U.S. Classic – Meet Results" (PDF). USA Gymnastics. Archived from the original (PDF) on August 12, 2014. Retrieved October 31, 2015. ^ "USA Gymnastics Announces U.S. Women's Team For 2014 World Championships". USA Gymnastics. September 17, 2014. Retrieved September 18, 2014. ^ "Simone Biles has a sting in her tail after bee flies out from flower bouquet to disrupt gymnastics medal ceremony". Daily Mail. Retrieved October 31, 2015. ^ "USA's Simone Biles returns with four world golds and lots of buzz (but no bee stings)". Fox Sports. Retrieved October 31, 2015. ^ "Vote Now To Decide 2014's Most Outstanding Amateur Athlete". Amateur Athletic Union. Retrieved October 31, 2015. ^ "2015 Secret U.S. Classic". USA Gymnastics. July 25, 2015. Retrieved July 26, 2015. ^ Penny, Brandon (August 16, 2015). "Unbeatable Simone Biles Becomes First Woman In 23 Years To Win Three National Titles". United States Olympic Committee. Retrieved October 31, 2015. ^ "U.S. Women Win Third Straight World Gymnastics Title". United States Olympic Committee. October 27, 2015. Retrieved October 29, 2015. ^ "Simone Biles – Interview – 2015 World Championships – All-Around Final". USA Gymnastics. Retrieved October 29, 2015. ^ Axon, Rachel (October 29, 2015). "Simone Biles wins third all-around title at World Gymnastics Championships". USA Today. Retrieved October 29, 2015. ^ "Simone Biles Is First Gymnast To Win Three Straight World All-Around Titles While Gabby Douglas Earns Silver". United States Olympic Committee. Associated Press. October 29, 2015. Retrieved October 29, 2015. ^ Crawford, Aimee (September 21, 2016). "Bravo, Simone Biles, for taking a stand against ADHD stigma". ESPN. Retrieved October 25, 2016. ^ Strachan, Maxwell (September 16, 2016). "Simone Biles Proudly Opens Up About Having ADHD". Huffington Post. Retrieved October 25, 2016. ^ "Dominique Dawes Predicts How Many Golds for Simone Biles?". June 30, 2016. ^ Hameed, Anique M.; MPA; OCG, ContributorFounder of; Good, A. Social; Consultancy, Philanthropic; good, the Black Philanthropy Matters campaign Writing about social; entrepreneurship; empowerment. (July 14, 2016). "Olympic Gymnasts Simone Biles, Dominique Dawes, And Nadia Comaneci Partner In 'The Evolution of Power' Video". HuffPost. ^ Fincher, Julia (August 11, 2016). "Simone Biles bests Aly Raisman for all-around gold". nbcolympics.com. Retrieved August 11, 2016. ^ Barnas, Jo-Ann (August 14, 2016). "Biles becomes most decorated U.S. gymnast with Olympic vault gold". USA Gymnastics. Indianapolis, Indiana. Retrieved August 15, 2016. With three golds, she has already set the U.S. mark for most gold medals in women's gymnastics at a single Games. ^ Axon, Rachel (August 20, 2016). "Simone Biles chosen to carry U.S. flag at closing ceremony of Rio Olympics". USA Today. Retrieved October 25, 2016. ^ "Simone Biles sets when to return to training". NBC Sports. January 19, 2017. ^ Finley, Taryn (September 7, 2016). "Simone Biles To Write A Memoir Aptly Titled 'Courage to Soar'". Huffington Post. Retrieved December 9, 2018. ^ Löfflmann, Georg (January 18, 2018). Competing Visions for America – Popular Discourses of Grand Strategy on the New York Times Best-Sellers List. Edinburgh University Press. doi:10.3366/edinburgh/9781474419765.003.0004. ISBN 9781474419765. ^ "The Simone Biles Story: Courage to Soar". Lifetime. ^ "'Dancing With the Stars' 2017: Season 24 celebrity cast and partners revealed on 'GMA'". ABC News. March 1, 2016. Retrieved March 1, 2016. ^ "Simone Biles says she's back in the gym (video)". NBC Sports. August 19, 2017. ^ "Simone Biles Returns To Gymnastics Training With New Coach Laurent Landi". FloGymnastics. October 17, 2017. ^ "Simone Biles will not follow Aimee Boorman to Florida, report says". NBC Sports. November 29, 2016. ^ "Women's Athlete Selection Committee adds Biles to U.S. National Team". USA Gymnastics. March 1, 2018. ^ "Simone Biles added to USA Gymnastics team". USA TODAY. Retrieved December 10, 2018. ^ "World, Olympic, U.S. champions expected to compete at 2018 GK U.S. Classic". USA Gymnastics. July 16, 2018. ^ "Biles, Wong win all-around titles at 2018 GK U.S. Classic". USA Gymnastics. July 28, 2018. ^ "With all-around win at U.S. Classic, Simone Biles proves she's back, and better than ever". espnW. Retrieved October 2, 2018. ^ Zaccardi, Nick (August 20, 2018). "Simone Biles wins every gold medal at U.S. Championships". OlympicTalk. NBC Sports. Retrieved August 21, 2018. ^ "Biles shines on all four events on way to record fifth U.S. senior all-around title". USA Gymnastics. August 19, 2018. ^ "Simone Biles wins record fifth US all-around title as comeback continues". BBC Sport. August 20, 2018. Retrieved August 20, 2018. ^ "2018 U.S. Championships Results, Recaps, Photos, Videos". USA Gymnastics. Retrieved October 2, 2018. ^ "Roster: U.S. Women's 2018 World Team Selection Camp". Retrieved October 2, 2018. ^ "Kitazono Makes History And Gymnastics Breaks New Ground At Buenos Aires 2018". Olympic Channel. November 9, 2018. ^ "Gymnastics: Tamara Ong wins gold in multi-national team event at Youth Olympics". The Straits Times. October 12, 2018. ^ "Biles wins U.S. women's World Team Selection Camp competition". USA Gymnastics. October 11, 2018. ^ "USA Gymnastics announces 2018 U.S. Women's World Championships Team". USA Gymnastics. October 12, 2018. ^ "Qualification line-up for U.S. women is announced for 2018 World Championships". USA Gymnastics. October 25, 2018. ^ "Simone Biles gets a Vault Named After Her 24 Hours After Going to the ER for a Kidney Stone". Deadspin. October 27, 2018. ^ "Simone Biles dominates at world championships despite kidney stone". ESPN. October 27, 2018. ^ "U.S. women qualify for team finals with first-place team qualification ranking at 2018 World Championships". USA Gymnastics. October 28, 2018. ^ "U.S. women win team title at 2018 World Championships, qualify for 2020 Olympic Games". USA Gymnastics. October 30, 2018. ^ "Simone Biles, U.S. gymnastics team win world title by record margin". NBC Sports. October 30, 2018. ^ "Biles overcomes errors to win all-around at world championships". ESPN. November 1, 2018. ^ "Simone Biles makes history as first woman to win four all-around world titles". USA Today. November 1, 2018. ^ "Gymnastics: Diminutive Biles stands tall among greats". Reuters. August 11, 2016. ^ "Simone Biles wins record 13th world title, completes medal set". NBC Sports. November 2, 2018. ^ "With Uneven Bars Silver Medal, Simone Biles Now Has World Medals On Every Event". Team USA. November 2, 2018. ^ "Simone Biles is 6-for-6, becomes first American to win medals in every event at worlds". USA TODAY. Retrieved November 3, 2018. ^ "World, Olympic champ Simone Biles to compete in Germany in March". ESPN. January 21, 2019. ^ "Biles And Mustafina Are On The Stuttgart World Cup Roster". Gymnovosti. January 21, 2019. ^ "Biles win's women's all-around at DTB Pokal World Cup". USA Gymnastics. March 17, 2019. ^ Axon, Rachel (December 10, 2015). "Simone Biles named U.S. Female Olympic Athlete of the Year". USA Today. Retrieved July 8, 2016. ^ Glamour. "Glamour's Women of the Year 2016: Gwen Stefani, Simone Biles, Ashley Graham, and More Honorees". Glamour. Retrieved December 9, 2018. ^ "Slideshow: 2014 espnW Impact 25". ESPN. Retrieved October 31, 2015. ^ "Sportswoman of the Year". Women's Sport Foundation. Retrieved October 31, 2015. ^ Geoff Herbert. "Time Person of the Year: 2016 finalists revealed – who should win?". syracuse.com. Retrieved December 8, 2016. ^ Nordyke, Kimberly (July 13, 2016). "ESPY Awards: The Winners List". The Hollywood Reporter. Retrieved July 14, 2016. ^ "Liukin, Johnson win ESPY Awards". USA Gymnastics. July 16, 2009. ^ Wells, Adam. "ESPY 2017 Winners: Awards Results, Recap, Top Moments and Twitter Reaction". Retrieved July 13, 2017. ^ "Simone Biles – The Shorty Awards". shortyawards.com. Retrieved December 10, 2018. ^ "The Dominant 20: The best of the best". ESPN. December 11, 2018. ^ "The Dominant 20". ESPN. December 11, 2018. ^ "Most dominant athlete of 2018: Simone Biles". The Undefeated. December 11, 2018. ^ "Biles wins 2019 'Sportswoman of the Year' at Laureus World Sports Awards". International Gymnastics Federation. February 19, 2019. ^ "Simone Biles Turns Pro". FloGymnastics. July 29, 2015. ^ "Simone Biles on Twitter: "It's official. I am proud to announce I am a Nike Athlete? having fun here in Portland #JustDoIt "". Retrieved July 7, 2016. ^ "Simone Biles Signs With GK Elite Sportswear". www.flogymnastics.com. Retrieved December 10, 2018. ^ a b "Core Power partners with Simone Biles". www.bevindustry.com. Retrieved December 10, 2018. ^ "Simone Biles & The Final Five Are Officially On A Cereal Box!". www.refinery29.com. Retrieved December 10, 2018. ^ "Gold medalist Biles signs her 1st post-Rio deal". ESPN.com. September 20, 2016. Retrieved December 10, 2018. ^ Ilchi, Layla; Ilchi, Layla (October 8, 2018). "Caboodles Re-brands, Partners With Simone Biles". WWD. Retrieved December 10, 2018. ^ "Meet Simone Biles' adorable new puppy (who already has more Instagram followers than you)". espnW. Retrieved December 10, 2018. ^ Grinberg, Emanuella (January 16, 2018). "Simone Biles says Larry Nassar abused her". CNN. ^ Levenson, Eric (February 1, 2018). "Simone Biles: I wasn't emotionally ready to face Larry Nassar again". CNN. ^ Cacciola, Scott; Mather, Victor (January 24, 2018). "Larry Nassar Sentencing: 'I Just Signed Your Death Warrant'". The New York Times. ISSN 0362-4331. Retrieved December 10, 2018. ^ "Biles pays tribute to survivors in nationals sweep". ESPN.com. August 20, 2018. Retrieved December 10, 2018.